We are putting a new twist on our Saturday Sampler Class. New name, new format. 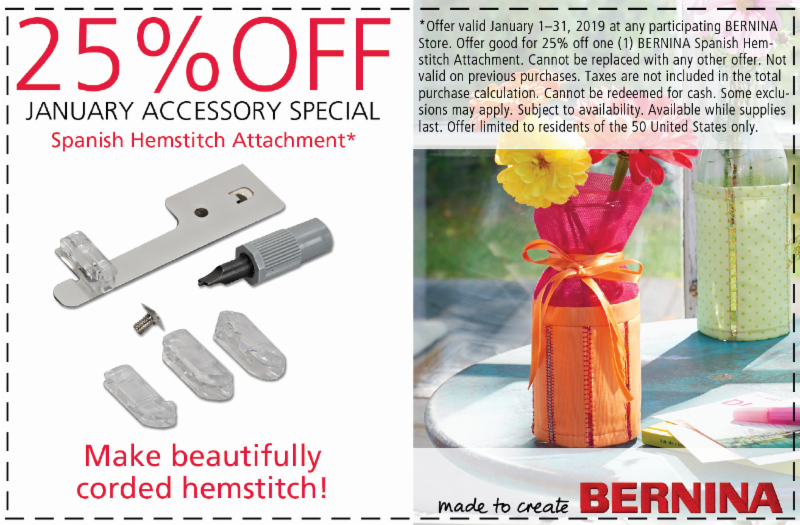 Each month we will showcase a BERNINA Foot or Accessory. We will have demonstrations on the foot or accessory and share a quick project with you. For January it is the #47 Spanish Hemstitch Attachment. It is the January Accessory of the Month. Click on the link above to see it in action. Foot Fun will be 10 monthly sessions (excluding June and December). Cost is $12.50/monthly session. Sign up and pay for the entire year in January and you pay only $100. That's getting two classes FREE!